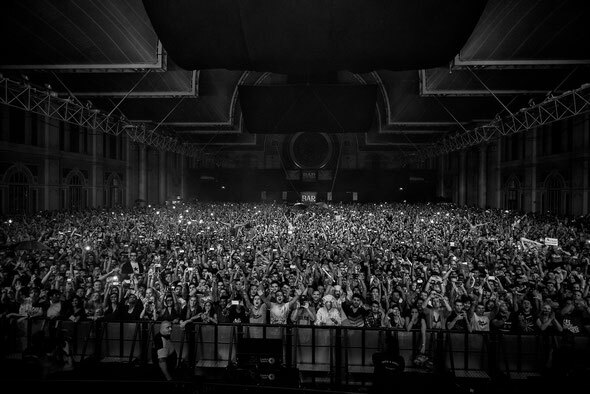 Just days after their acoustic shows at LA's Greek Theatre, Above & Beyond did a live broadcast from London's 10,000 capacity Alexandra Palace on Saturday, during which they debuted five brand new personal productions. Sold out weeks in advance, the ABGT050 event means Above & Beyond have sold over 20,000 tickets across their latest two show weekends on both sides of the Atlantic. Celebrating their landmark 500th radio show and the 50th episode of "Group Therapy" since renaming the show last year, the London based trio opened their set with a new Genix remix of Above & Beyond classic ‘Anjunabeach’, before a techno-influenced remix of New Order's iconic ‘Blue Monday’. Also debuted were two brand new instrumentals – ‘Mariana Trench’ and ‘ID’ - which both fused hard-hitting club elements with the deep, melodic musicality that the band are known for. Teasing fans with a possible track from their third artist album, expected in 2014, Above & Beyond also dropped a new vocal track featuring Alex Vargas, titled ‘Sticky Fingers’. Other debuts included ‘Prototype’ by Artificial, new project from Anjunabeats’ Andrew Bayer and Norin & Rad, and a slew of new melodic productions from Ilan Bluestone. Fans were also treated to an as-yet-unidentified remix of the A&B classic ‘Alone Tonight’, as well as a preview from the forthcoming A&B Acoustic album, when Above & Beyond dropped ‘Sun & Moon Acoustic’ as their closing track - prompting a memorable crowd singalong. Check it below.